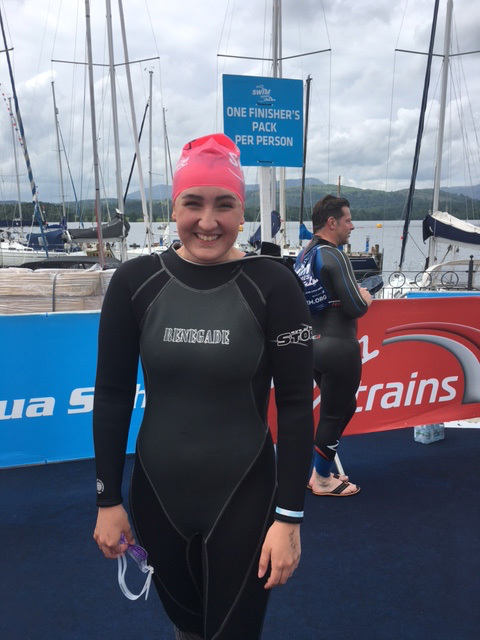 On Sunday 12th June Phoebe Willan took part in the Great North Swim, swimming a mile of Lake Winderemere! Phoebe said "I have wanted to take part in an open water swim for the past few years and couldn't think of a better charity to do it for than the Ally Cadence Trust (ACT) for SMA. I have had the pleasure of attending the Butterfly Ball for two consecutive years which gives just a small insight into the amazing work they do and the families they help all year through. All donations are highly appreciated and will go towards helping families affected by Type 1 Spinal Muscular Atrophy. Thank you for supporting me and ACT for SMA"
In Phoebe's training she had been completing a mile in around 45 minutes, with a 44 minute personal best. However, on the day she smashed this completing the mile in just 35 minutes! We were so pleased to be there supporting Phoebe and seeing such an amazing achievement. Thank you Phoebe, and thank you to everyone that sponsored her. You can still visit Phoebe's page by clicking here.